In compliance with California AB1195, speakers are asked to address and reviewers are to identify course curriculum that includes cultural and linguistic competency, including issues relating to ethnicity, religion, age, gender, disability, etc. 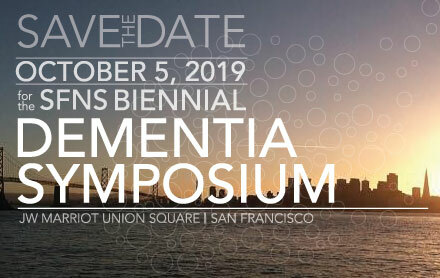 The San Francisco Neurological Society (SFNS) is committed to excellence in the neurosciences as well as the professional and intellectual development of its members. Our program is designed to improve and amplify critical thinking and analysis of the latest neuroscientific information, to help promote innovation in the basic neurosciences, and to enhance performance and increase competence in the care of persons with diseases of the nervous system. This is accomplished by providing diverse, advanced, relevant, judicious, challenging and sometimes, controversial information in the neurosciences, provided through didactic programs and scholarly debate. If you cannot attend an event after you have pre-registered, please notify us 48 hours in advance and we will refund your money minus a $25 handling fee. Dean Ornish, M.D. and his colleagues at the nonprofit Preventive Medicine Research Institute, in collaboration with Bruce L. Miller, M.D. and Joel Kramer, PhD at the UCSF Memory and Aging Center, and others, are conducting the first randomized controlled trial to determine if the progression of early to moderate Alzheimer’s disease may be reversed by a comprehensive lifestyle medicine program. The lifestyle medicine program includes a whole foods plant-based diet; moderate exercise; stress management techniques; and psychosocial support. For more information please visit www.pmri.org or call 415-332-2525 x255.